From southbound I-71 (Columbus): I-71 will be under major construction and delays are likely. It is recommended that I-275 be taken west to I-75, then south. From southbound I-74 (Indianapolis): follow I-75 south. 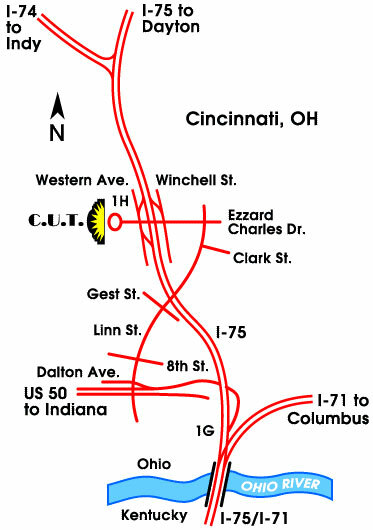 From southbound I-75: follow signs to the Museum Center, exit 1H, Ezzard Charles Drive, take the first right onto Ezzard Charles. Northbound I-75: immediately after crossing the Ohio River and I-71 North exit, take Dalton Avenue/Linn Street exit 1G to US 50 west. Veer right and take Linn Street north five blocks, then turn left onto Ezzard Charles. Several food establishments and motels are a 10-minute drive from C.U.T. off I-75 south at the first exit in Kentucky.